One customer referred to the can opener as a workhorse, able to open up both small and large cans well — however, a word of warning: some had issue with it tipping when working with oversized ones. People also love how clean the cuts are, how long it lasts, and how easy it is to use for people with arthritis or stiffness in their hands. If you want to ensure that your cans will open with a smooth edge, a side-cutting system is important. 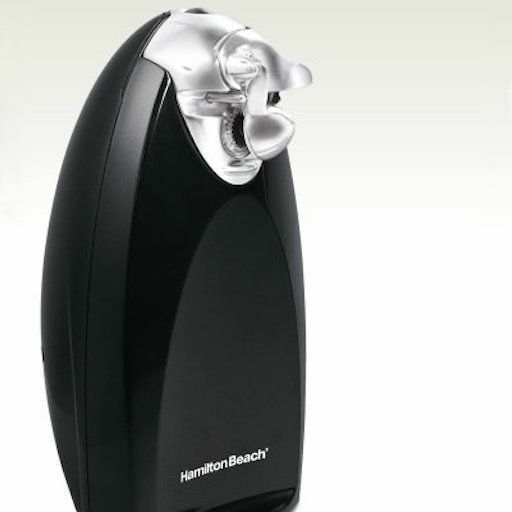 This one from Hamilton Beach has that feature, and it’s also just a great product all around. It can open cans of any size including pop-tops and has an ergonomic lever that doesn’t require a lot of strength. Designed with chrome and black features, it’s sleek and attractive on the counter. You can also buy this model with stainless-steel kitchen scissors and storage slot. Most customers have been extremely happy with this product saying the edges come out very smooth and it’s easy to use. If you are thinking about getting the scissors, one customer warned that they are smaller than you might expect. Also, be forewarned: if you go around the edge more than once with the opener, metal shards might end up in your food. It’s something you’ll have to be careful with if you purchase this product. Like our budget pick, this one is handheld and while it’s more expensive, it’s also top quality. It requires four AA batteries, which are conveniently included with your purchase, and can turn on and open cans of any size with the touch of a button. Thanks to an innovative side-cutting system, it’ll leave the edges smooth so it’s not only safe, but you can reseal it too. What makes this great especially for seniors and those with arthritis is that it can travel around the can 360 degrees so that you don’t have to twist or turn your hand while operating it. One customer said this is one of those purchases that goes way beyond expectations thanks to its great design and performance. Others noted how nice it is to be able to store it in the drawer thanks to its compact size. If you’re opening up a lot of cans per day, however, it might not be the best choice as one noted that it wore out quickly. But most were happy with the overall product and would recommend it to others. If you don’t want to spend a lot of money on an electric can opener, but still want something that will get the job done well, this one is a good option. What’s great about it is the fact that it’s small and compact, so it won’t take up too much room among your other kitchen gadgets. You can turn it on and stop it with the touch of a button, and it’ll safely cut beneath the lid so you won’t have to deal with sharp edges. Even though it’s small, it can open cans of all sizes — including large — according to the description. Overall, it’s a simple product that doesn’t cost a lot. While some customers had issues with it not working well or breaking sooner than they had expected, most were happy with its performance and felt like it was worth the money they paid for it. One of the sleeker designs on the market right now, this gorgeous brushed stainless steel can opener from Cuisinart cuts with precision and features an extra-wide heavy bottom base that helps to keep it from sliding or tipping while in use. For extra protection, it also has rubber feet so no slipping will happen either. The blade and magnetic lid holder are removable which makes cleaning more easy. Customers love that the product is entirely made of solid metal with no plastic parts to it, and it seems to be relatively quiet while in use. They also say that it opens the cans smoothly, and heavy cans don’t seem to be a problem for the device to hold. One reviewer reported the product giving out after a couple of years of limited use, but otherwise, customers have been mostly happy with the can opener. If you want to save counter space but a handheld electric can opener isn’t right for you, consider an under-the-cabinet one like this one from BLACK+DECKER. It’s pretty easy to install and looks sleek since all the features are hidden behind a swing-open door. Besides opening up cans easily, it can also sharpen your knives, cut your bags, and open your bottles. The item weighs a little over a pound and measures 6.5 x 7.5 x 5 inches. A popular item in the electric can opener category, customers are mostly happy with the performance and quality of the items. Many said it was easy to mount and the features work well. Note: it works best for flat-bottom cabinets, but if yours has an overhang, you can use a space saver to install. In terms of negative reviews, some have found it big and bulky-looking, but if you plan on using it a lot, it could be worth it to save counter space. Want to take a look at some other options? See our guide to the best can openers.